About Firehouse Pizza. 766-7171 North Smithfield Rhode Island, RI. Pizza, subs, salads and more! Originally started by two local firemen, Firehouse changed hands twice before being taken over by it's current owner. Bob Brouillard Jr. took over Firehouse in 1981. Firehouse has also been known by a few names. 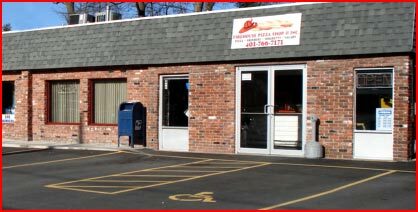 It started out as Firehouse Pizza Palace - changed to Firehouse Pizza Shoppe Inc. - then was reincorporated in 1989 as Firehouse Pizza Shop II. Firehouse prides itself on making fresh pizzas, subs, spaghetti and salads from the finest ingredients available in our area. We have been using cholesterol-free oil to make our french fries and other fried foods since we've opened. Our hamburgers and ground beef for meatballs are specially ground for us by a local butcher and delivered fresh daily. We make our own special recipies of pizza dough, pizza and spaghetti sauces, meatballs, tuna, seafood, egg salad and fresh salads. Our extra lean shaved steak is sliced fresh daily. We strive for consistency in all of our products so that you know what to expect each time you come in ~ a fresh, tasty meal served quickly.